When perfumistas with vast, expensive fragrance collections and tastes similar to yours urge you repeatedly to do something because “you’ll love it,” a person tends to listen. 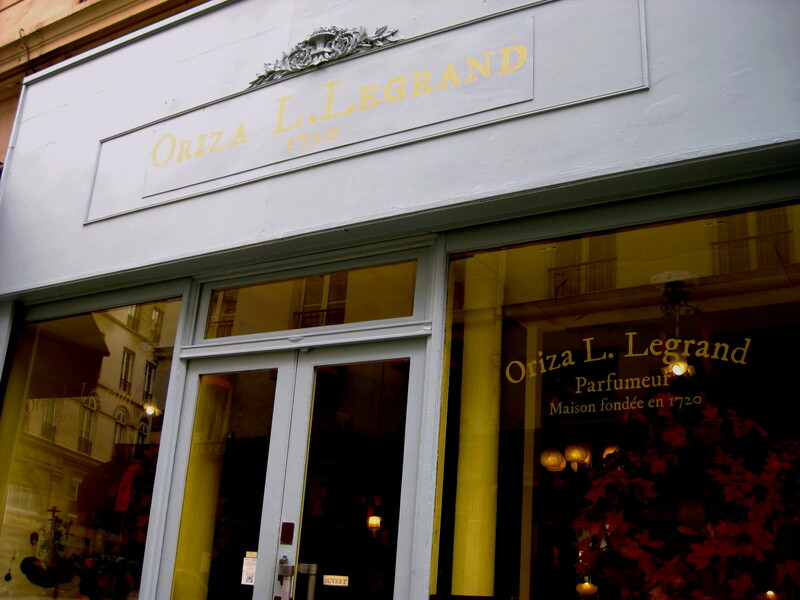 Again and again, before my Paris trip, I was told that I had to go to Oriza L. Legrand, not because I am a history fanatic, but because of the sophistication, complexity, depth and elegant luxuriousness of their perfumes. I’m glad I listened, because I was utterly entranced. 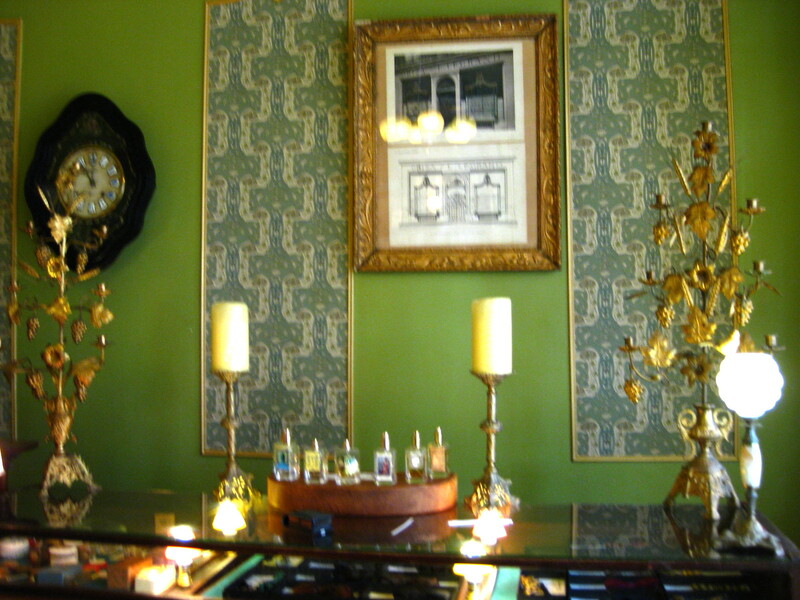 The history is fantastic, the boutique utterly adorable and filled with quirky personality, and the perfumes are lovely. In one case, so absolutely incredible that it stopped me in my tracks while on my way to buy my precious bell-jar from Serge Lutens. Those of you who know me (and my feelings about Serge Lutens) will realise that it takes a hell of a lot to make me turn around in my set journey to my perfume mecca — let alone to get distracted enough from Serge Lutens to buy another perfume, then and there, and after a mere 15 minutes! But that is precisely what happened with Oriza L. Legrand‘s Chypre Mousse, a fragrance that I will review (along with some others from the line) in another post. 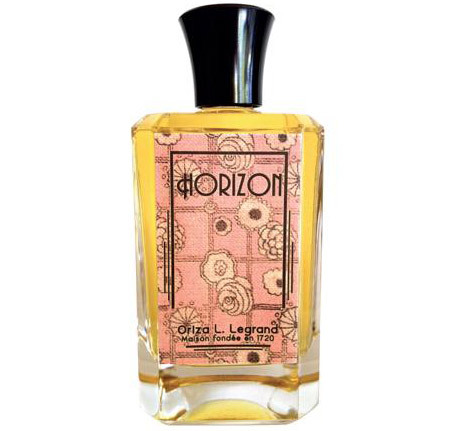 The funny thing is that I had actually gone to Oriza with plans to investigate a completely different perfume, a patchouli-cognac-amber fragrance called Horizon whose lengthy list of notes had called to me like a siren song. It’s a beautiful patchouli-amber, but, in the end, it could not compare to the utterly haunting, unique loveliness that is Chypre Mousse. To me, Chypre Mousse is the damp, mossy, forest, leafy version of Serge Lutens‘ delicate floral triumph, De Profundis. My fellow blogging friend, Undina, once described De Profundis as a “homage to life,” and I think that beautiful phrase is also the ideal way to describe Chypre Mousse. I mean it quite seriously when I say that I think the perfume is a masterpiece. I was impressed enough by Oriza L. Legrand (hereinafter just “Oriza“) that I decided to begin my coverage with a little overview of the brand. So this post will address Oriza’s history, its return to the perfume scene, and, at the very end, some of the fragrances that stood out for me. 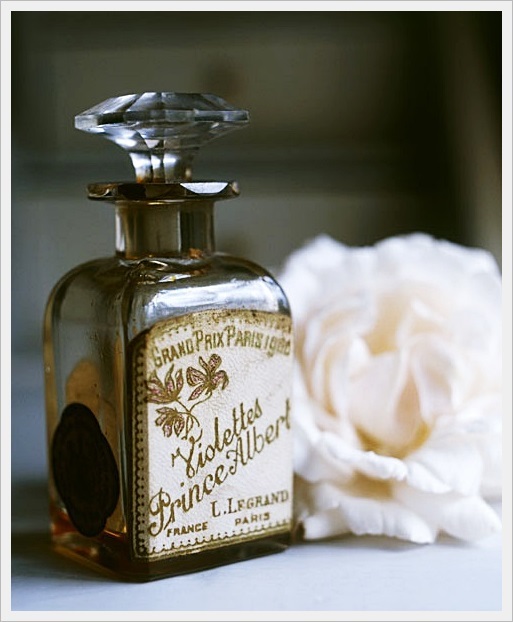 It will also focus on how the perfumes may have changed from their very original formulation. I was lucky to stumble across a superb interview with one of Oriza’s new owners in which he explains how he’s dealt with perfume formulas that go back to 1899 and the early 1900s, the tweaks he’s made in order to offer a slightly modernized version, some very famous fans of the new fragrances, and more. In addition, I have to include some photos from my own time in the boutique. I loved the time-capsule feel of the store with its vintage posters or adverts from the early 1900s, its quirky collection of bow-ties made from vintage silk, and its brightly coloured window displays. As usual for this trip, my tiny camera wasn’t very cooperative. Nonetheless, I hope it gives you a little sense of what the Oriza boutique is like, especially if you are planning a visit to Paris. At the very end will be a discussion of some of my favorite Oriza perfumes thus far, along with their notes, and an explanation of how you can try the line for yourself. 1720, King Louis XV, and famous beauties. 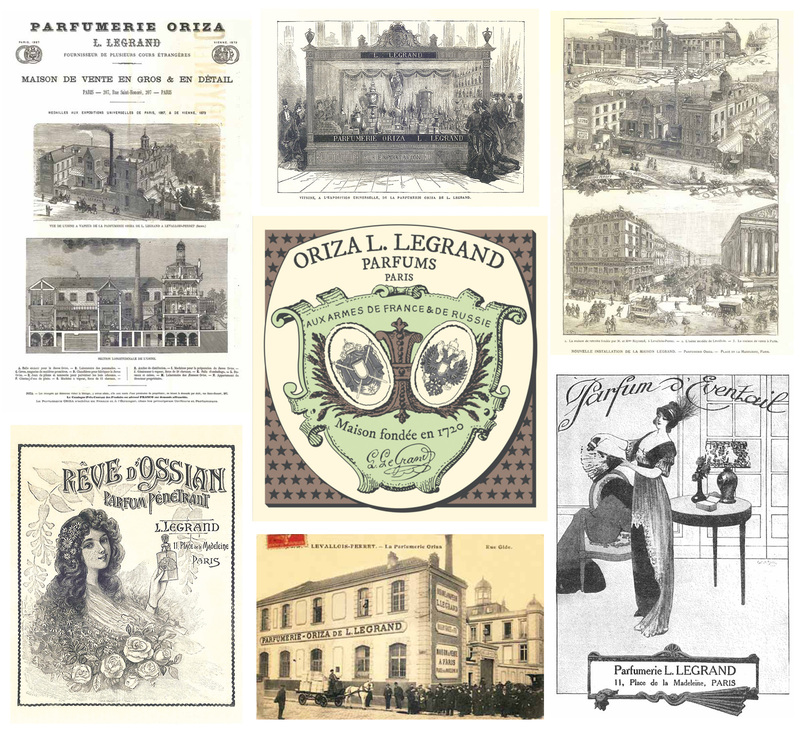 Far before Guerlain, Grossmith, Creed or the like, there was Oriza L. Legrand. The brand originated with Fargeon the Elder who set up his first shop in the Louvre Palace’s central court, and who made a fragrance for the young king. It probably helped Oriza even more that Fargeon’s potions and creams were rumoured to be the secret of Ninon de Lenclos, a great courtesan known for her beauty and eternal youth. As for the name of the house, it derives from Oryza Sativa, the latin name for rice, which was part of the cosmetics’ ingredients. Then in 1811, Louis Legrand took over the house as he understood all the potential prestige it had. With its fragrant creations, he pushed it to its full extent. It is him who introduced the perfumes in the house although Fargeon, in his time, had created a fragrance for Louis XV, the young king. [Eventually] Oriza was one of the rare houses that provided the Courts of Russia, England, Italy and France. In France, it lasted until Napoleon 3. 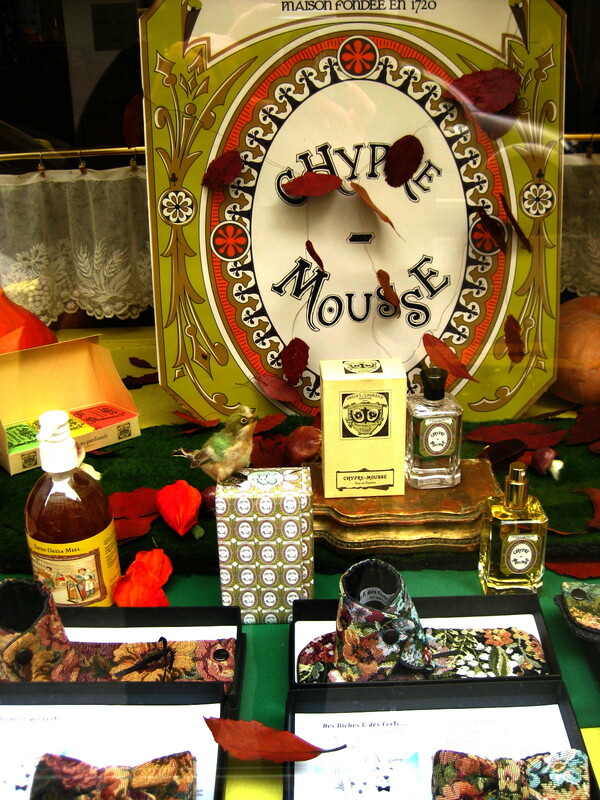 The house was also one of the firsts to turn its fragrances into lines of products. It has become the most natural thing now, but it wasn’t back at that time. For Déjà le Printemps, you had a perfume, a powder, make-up, soaps… You see, when I saw the industrial, powerful and innovative aspects of the house, I fell in love right away. I wanted to give it a second birth and give it its prestige back. At the start of the 1900s, Oriza continued to enjoy success. It participated in the World Fairs, which were very big things back then and one of the rare occasions when the very best artisans, merchants, and luxury lines could present all their wares in one place. In essence, it was a sort of prestigious Olympics.In 1889, Oriza took home the Gold Medal for its perfumes but, in 1900, it received the very top honours with the Grand Prize. I’ve found a photo of the perfume which may have won and which may have been named after Prince Albert, Queen Victoria’s consort. One of the ancient Oriza bottles, in baccarat crystal as many used to be. The name of this one translates to “Violets Prince Albert” and it seems to be the Grand Prize winner at the 1900 World Fair. Source: lylouannephotos.blogspot.com with the photo originally from Flickr. Then, alas, things came to a crashing halt in the 1930s, and obviously WWII didn’t help matters. The house completely died. 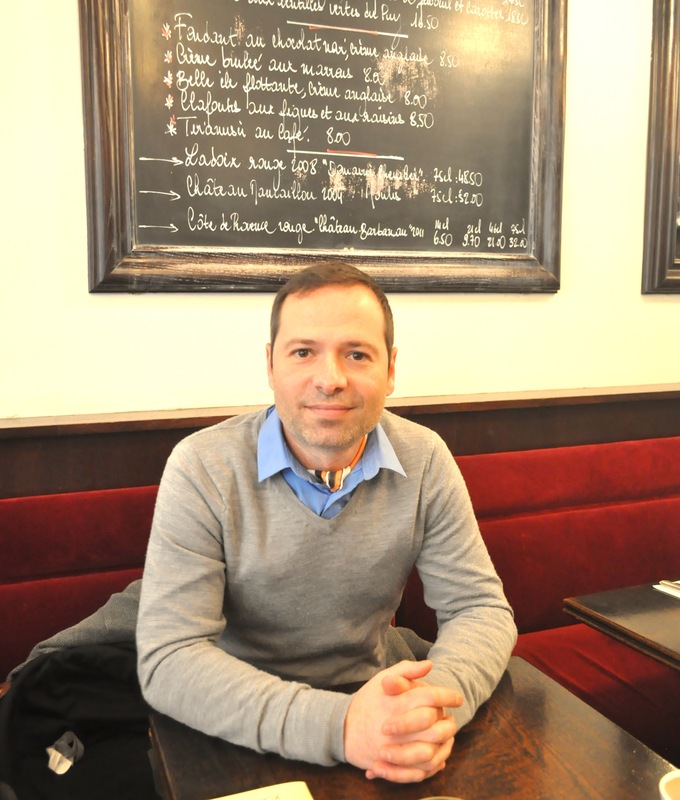 Franck Belaiche. Source: Flair Flair. What did you think when you bought it? What did you want to do with it? I wanted to make it modern while keeping its essence and soul intact. I first had to select, among the 80 fragrances that had been created, which ones were likely to be adapted, reworked from their original formulas, and still be appealing. A good number of them are not easy to wear, especially since Raynaud and the steam extraction technique gave birth to many florals. But there were also a few synthetic molecules which allowed the creation of what we would call today “orientals”. I’ve had to work with the labs to see what we could do based on the formulas and also on the juices, since I have managed to get hold of some old, full bottles. I wanted to get close to the old perfumes while making them modern, without betraying them. So from the beginning you wanted to make these formulas contemporary? It was never about saying “This is exactly what perfume smelled like back then”? No, and let’s face it, that would have been impossible. First because of the raw materials that we can no longer use, and also because it would have mean making sent-bon (French for smell good). Besides, although these fragrances were high quality, they correspond to a time that is not necessarily ours. With Déjà le Printemps, just like the three others, we are very close to the original, but there is this little something that makes it modern. Careful though, reworking a fragrance does not mean making it attractive to a majority. Right now, I am working on the next two perfumes, which will come out at the end of January. The whole 2012 interview is fascinating, excellent, and really informative. I urge any of you who may be interested in the technical aspects of how ancient fragrances are brought back to life, to read it in full. It addresses everything from the work process with the laboratory in Grasse and its chemists and perfumers, to the way that perfumes have changed since the time of Louis XV, and the company’s future plans. You can also learn more about Oriza, its current ownership, and the reconstruction of its scents from the lovely Caro of Te de Violetas who interviewed Mr. Belaiche back in September of this year. One part I found interesting in the Flair Flair interview was Mr. Belaiche’s explanation for why all the new “re-edits” of the original Oriza line pertained to its 1900-era fragrances, instead of the 1720s one. As he explains, it would not have been easy to do a tweaked version of something like Violette du Tsar, a perfume created for the Tsar of Russia. Moreover, “not a lot of people would have enjoyed it, and then starting with old perfumes didn’t seem to me like a relevant way of bringing the house back to life.” (But aren’t you dying to know what that may have smelled like?!) Clearly, Mr. Belaiche is not trying to recreate fragrances merely for the sake of nostalgia and historical curiosity. Instead, he wants to do the house proper justice by making Oriza a viable, current, commercially successful brand with a long-term future. In other words, he’s not trying to create a museum, but a living and breathing house that has a chance of success beyond just the initial curiosity factor. [Their perfume choices:] Déjà le Printemps for Catherine Deneuve and Relique d’Amour for Isabelle Adjani. I met Mr. Belaiche when I went to the Oriza boutique, along with his business partner and fellow Oriza owner, Hugo Lambert. They were both charming and very kind, though Mr. Belaiche seemed to blink a little at the extent of my enthusiastic outbursts over the fragrances and their quality. I don’t think he’s used to someone babbling a thousand words of English a minute, mixed in with French, while sniffing everything, taking photos from every angle, suddenly stopping in their tracks to announce “Aha! Armagnac! This has aged cognac in it!” in response to one fragrance, and being the sort of whirlwind that is rather uncommon to the very restrained French. I hope he took it as the compliment that it is — there are many niche perfume houses these days, I’m extremely hard to please, and I rarely find a brand to have impressively sophisticated, high-quality, original, creative or luxurious offerings almost across the entire line. 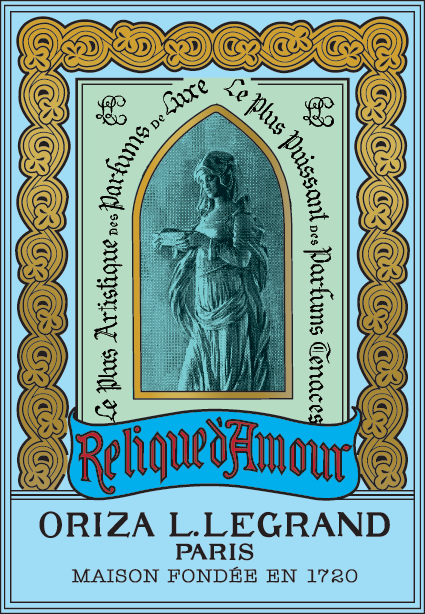 Relique d’Amour poster and perfume label. Source: Oriza L. Legrand website. I’d like to thank Mr. Belaiche for letting me take photos of the boutique, and I can only apologise to him for my camera taking such poor photos. While I’m at it, I’d also like to thank Mr. Lambert for providing me with a small decant of the beautiful patchouli scent, Horizon, to go with my purchase, even though he had to dig up a long vial from the back. As a side note, I wish I had managed to take photos of all the vintage Oriza posters and adverts framed under glass in the store. They were fascinating, and I’m so glad the new owners have kept the brand’s aesthetic, both in terms of the feel of their boutique and their perfume’s packaging. I’m a complete sucker for Art Deco, so I love Oriza’s brightly coloured labels with the old-style, vintage fonts. The exterior of the colourful store. 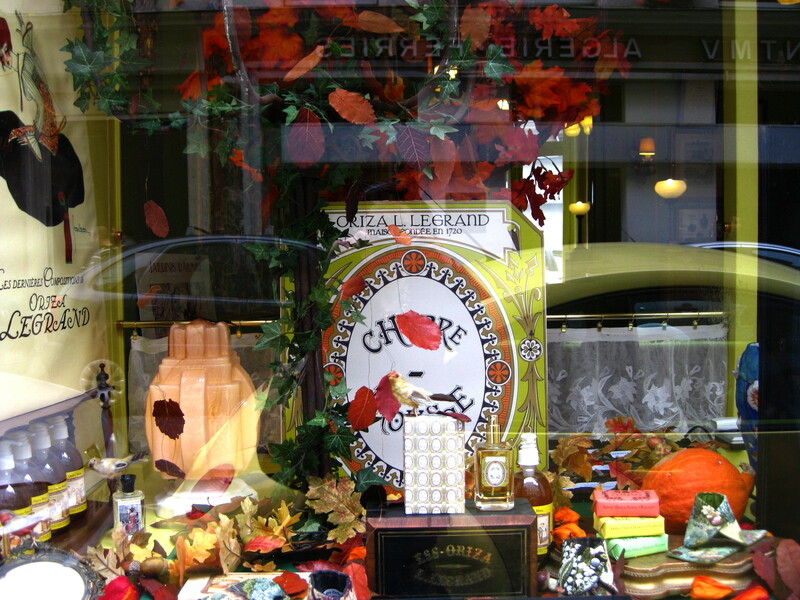 One Oriza store window, featuring Chypre Mousse and some of its collection of vintage bowties. Some of the soaps from the Oriza line, along with boxed perfumes wrapped in wonderfully old-fashioned, patterned paper. 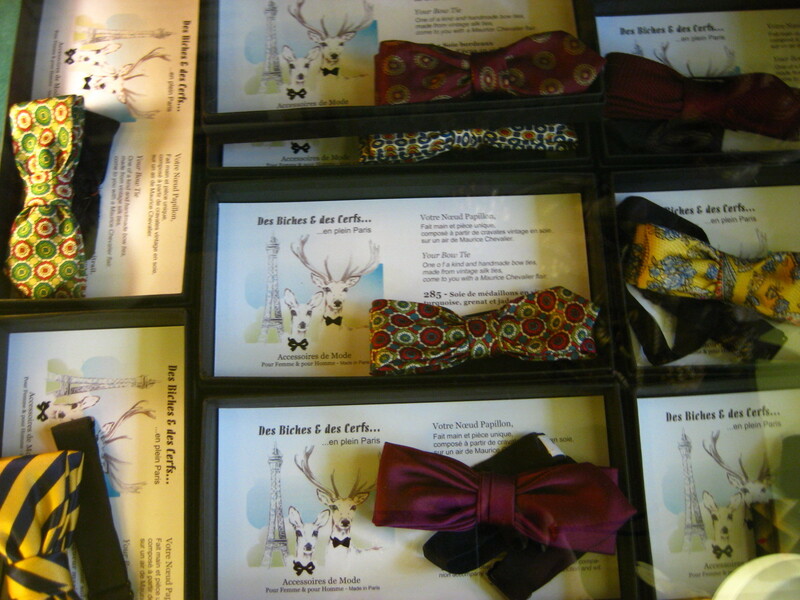 Part of the Oriza collection of bowties made out of vintage silk fabric. 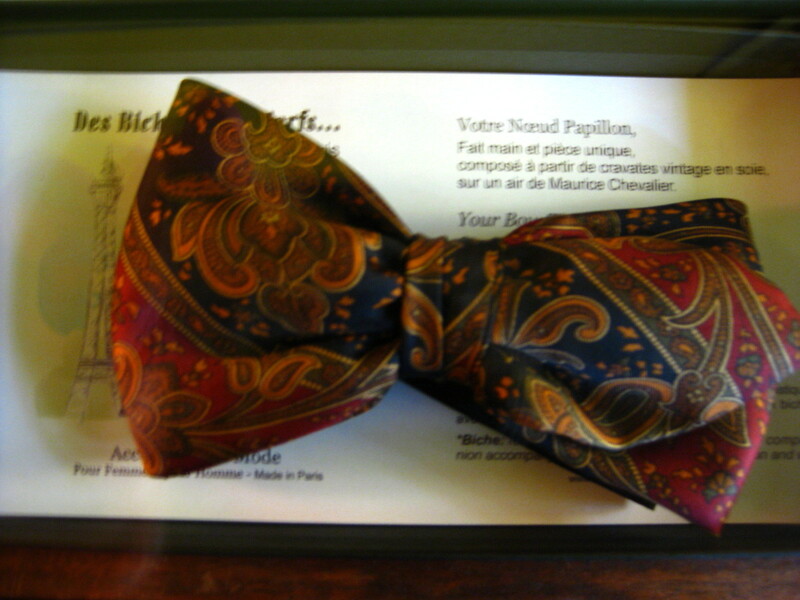 One of the bowties up close. 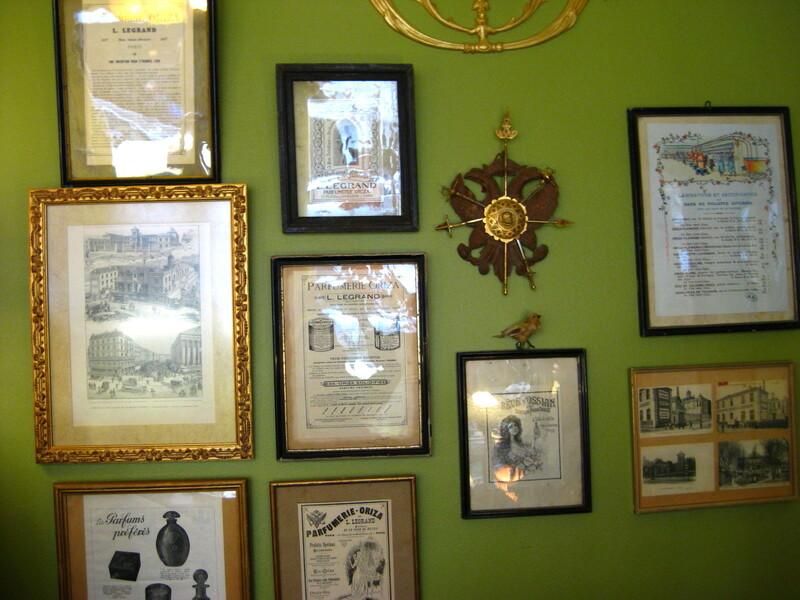 Some of the original 1900s posters and adverts for Oriza fragrances, now framed and under glass. That said, I don’t think the perfumes are generally something that a novice perfumista with commercial tastes would relate to very well. These are not scents that someone used to Estée Lauder‘s Beautiful or Viktor & Rolf‘s Flowerbomb would understand. I think that perfumistas whose tastes skew towards uncomplicated, light, clean, and wispy scents would also struggle a little. None of the Oriza fragrances that I’ve tried thus far would qualify as “wispy” or simple — thank God. They’re nothing like the By Kilian‘s with their largely straightforward, basic nature, or sometimes gourmand fruitiness. They’re too purely French to be like an Amouage or a Neela Vermeire, though they sometimes share both those house’s opulent sophistication. They’re full-bodied and with a vintage feel in terms of both their potent richness, their complexity, and their sophistication. 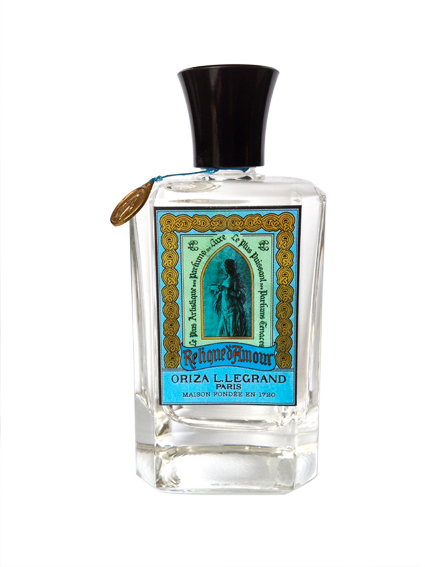 If you like the early Guerlains, the complicated originality of some Serge Lutens creations, or the sophisticated weight of Roja Dove’s fragrances, then Oriza L. Legrand will be for you. 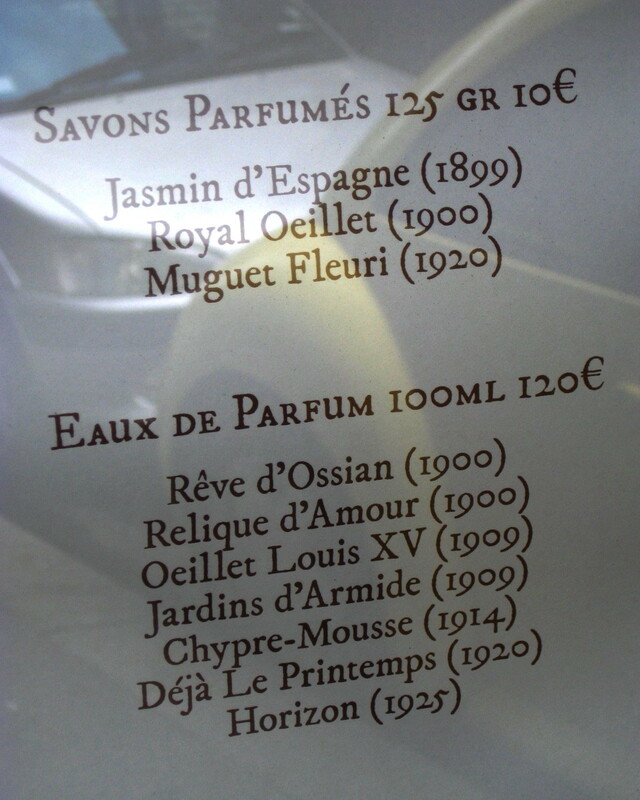 Oriza’s list of perfumes with their original date of production. Though I haven’t finished testing the whole line yet, the ones I have loved the most thus far have been three. 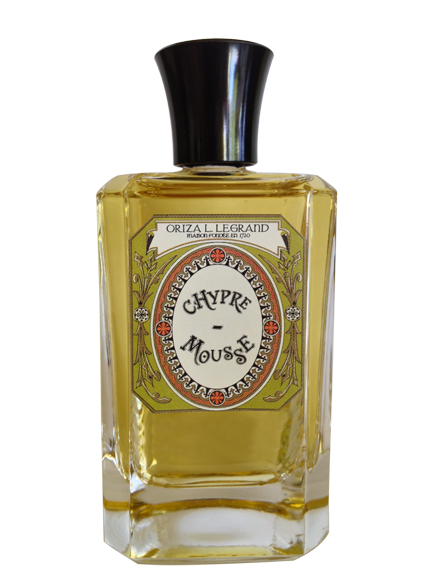 Chypre Mousse wins, hands down and by a landslide, as one of the most fascinating, haunting, evocative chypres I’ve smelled in ages. It is then followed with Horizon and Reve d’Ossian in a neck-and-neck position. The florals that I’ve briefly and cursorily tested thus far have sometimes smelled dated to me, though generally not in a bad way. 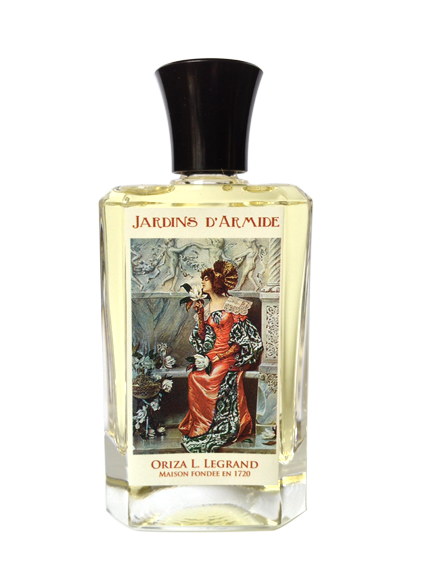 Only one of those triggered a strongly negative reaction: Jardins d’Armide, which felt too painfully difficult and old-fashioned with its heavy powder and its soapy feel. However, my perception has to be put in the context of one who dislikes powdery scents, and who loathes anything soapy, even expensive floral soap! Top Notes tonic & balsamic: Wild mint, clary sage, wild fennel & green shoots. Heart notes aromatic & flowing properties: Oakmoss, Galbanum, Angelica, fern, wild clover, Mastic & Violet leaves. Backgrounds Notes mossy & leathery: Vetiver, Pine Needles, Oak Moss, Mushroom fresh Humus, Roasted Chestnut Leather, labdanum & Balms. One thing that I need to emphasize about many of these note lists is that I don’t think they accurately convey the real nature of the fragrances. One reason is that the perfumes are superbly blended and a bit linear, so that you often get an overall effect, rather than a detailed, distinctive sense of each of their parts. For another, something about many of these fragrances is… well, for lack of a better term, other-worldly. I’ll be honest and say that one reason why I’ve put off reviewing Chypre Mousse is that I’m not sure I could even BEGIN to describe it properly and in-depth. I’m not one who is usually at a loss for descriptors or olfactory adjectives, but Chypre Mousse may be beyond my abilities. The smell is simply like nothing I’ve encountered. All in all, I think Oriza L. Legrand is a line that is definitely worth exploring. Though there are no U.S. retailers (yet), it’s easy to order directly from the company. In addition to the full bottles of the perfumes, they offer a sample set of the complete line. It’s quite inexpensive at €9 for 7 fragrances that come in 2 ml vials, thereby giving you quite a few test wearings. I think it’s well worth the minimal cost, and I believe Oriza ships the samples world-wide. If you’d like to sniff very elegant, very French, perfumed Sleeping Beauties, brought back to life after more than a century and in a largely unchanged form, give Oriza a try. Website: Oriza L. Legrand. There is an actual e-Store that offers perfume samples. All 7 fragrances in the range are offered in 2 ml spray vials for €9. Shipping is listed as €9 extra, but a friend said he was charged only €7. The perfumes themselves are all eau de parfum in concentration, and cost €120 for 100 ml/3.4 oz. Store address: 18 rue Saint-Augustin, 75002 Paris, France. Hours: Monday – Friday: 10:00 am to 7:30 pm; Saturday: 1:00 pm to 7:30 pm. Metro: Opéra ou 4 Septembre. Phone: 01 71 93 02 34. Other vendors in Europe: For a few other French vendors, as well as one store in Sweden and one in the Netherlands, you can check Oriza Points of Sale page. The Netherlands retailer is Parfumaria. This entry was posted in Chypres, Florals, Fragrances, Oriza L. Legrand, Patchouli Fragrances, Perfume Profiles or Interviews, Perfume Review and tagged Chypre Mousse, Franck Belaiche, Horizon, Hugo Lambert, Oriza Chypre Mousse, Oriza fragrances, Oriza L. Legrand, Oriza Paris, Oriza perfumes, Oriza Relique d'Amour, Oriza Reve d'Ossian by Kafkaesque. Bookmark the permalink. I wish to highlight the kindness of Mr. Hugo Lambert. For me it was to relive the history of French fragrances. Nice review Kafka. I like it. Well, I went and pulled the trigger on a sample set. What else will you lead us into? Dear Kafka, I think I have heard you mention Oriza L. Legrand before, but had no idea about the brands history and age! The history fanatic in me is excited to go, even though I must admit that the fact that there are no 1720 fragrances recreated is dissapointing to me, but I guess 1900 could do if they are amazing. And the price seem to be within the realm of possibility…But where is Rue Saint Augustin? Is it in district 8 or 7 or 6 or? I hope a can have some time to visit this place but it´s going to be even better if it´s in my way or in the area I´m going to be staying in. Leaving in two days from now 😀 . I love the fact that you talked about the brands history because I wouldn´t be as interested in it as I am now if I didn´t know about it, so thank you Kafka 🙂 . Hon, Rue Saint-Augustin is in the 2nd Arrondissement, a few blocks away from the Opera, so take a metro to that stop, get out and stare closely at the maps of the nearby streets that are always placed near the metro exits, and you should be able to see it. It’s a small tiny street, almost at a diagonal angle to the Opera. If your back is to the Opera, you’d continue to walk up and away from it, then turn left-ish (I think), and it would be a few streets away. I’m so excited for you and for your trip! Just a day away! 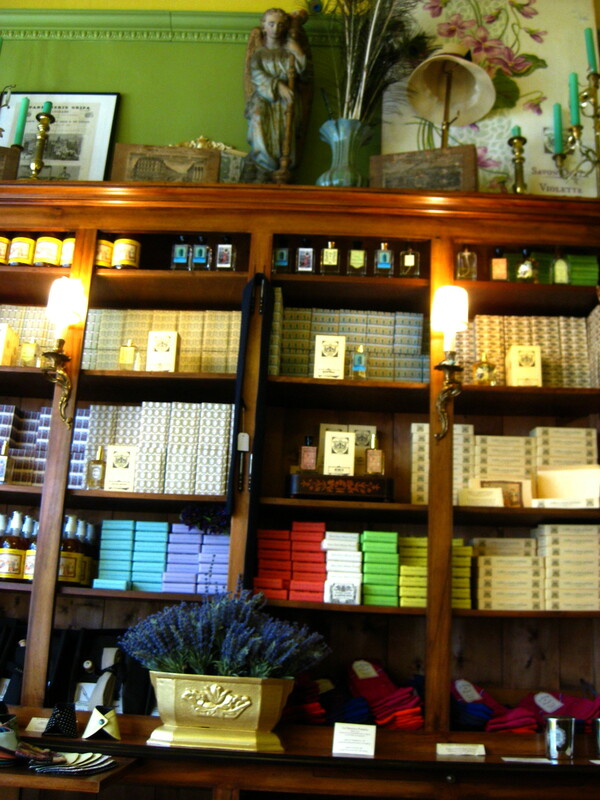 If you’re ever in the 4th Arrondissement, near the Marais, you should go to Marie-Antoinette (which is the only other place in Paris to carry the Oriza perfumes), and which has a lovely selection of stuff. More reasonable in price than Jovoy perhaps, but only about 1/8th the size of the Jovoy collection. Oh great 🙂 if it is in the Opera district I could definitely find it since I´m going to go to both the Opera Garnier and the Opera Bastille, and you can be sure that I´m going to see Le Marais, it´s actually in my lenghty to do list. I know I only have 11 days and one will be knocked down since I´m going to dedicate that day to Versalles, the whole domain or at least everything that is open to the public and the gardens. Even then I will try to go to Jovoy at least, hopefully also to this store or the Marie Antoinette one, although my top priority is to see districts, historical sites, museums and a few stores. Food is also on the list but number one is history! Too bad that these stores are not in the Luxembourg gardens area where I will be staying 😦 , but even then I´m sure to still go to both the Marais and Rue St. Honore, Vendome etc. so hopefully I will stumble on at least one of these gorgeous perfume boutiques 😛 . You should see my 10 page to do list! Ican foresee I´m going to end up very tired but happy 🙂 . Yes, I jumped on the samples as soon as … Horizon and the Chypre particularly grabbed my attention :). I’m so glad, Jane! You’ll have to let me know what you think of the two fragrances when they arrive. I don’t know your tastes, so I can’t guess how you’d feel about the florals in the line and their more dated feel. Do let me know if there are any you love. 🙂 At the very least, you’ll get the chance to test some very unusual perfumes that really evoke the past. Wow, for a scent to make you giddy like that it must be pretty amazing. You’re usually spot on with the ones you give a thumbs up to because I’ve liked quite a few of them. I love the back story of the fragrance house. I always find those interesting. I imagine it’s not easy to bring a house back to relevance while staying somewhat true to the original design. It must be so hard to stay generally faithful to something that’s over a 100 years old, while making it something that would appeal to very different modern tastes! I’m not sure I would enjoy a fragrance from 1720, given that the ingredients available at the time were extremely limited and the main purpose of scent in those days was to blanket out a lack of hygiene. I’m sure it would be so powdery and floral, as so many of them were back then. And Ugh to that. So, in that sense, I’m really glad they stuck to the more “modern” ones from the 1900s. There is one in the line, Reve d’Ossian, that I think would appeal to you in particular, Poodle. It’s very Church-y incense, but with a warmer, heavier and significantly woodier/foresty feel than something like Heeley’s Cardinal or Duchaufour’s Dzongka. The sample set is awesome, and a great deal. And Chypre Mousse. *drool* It’s so good. SO, so, so good! It will be interesting to see the future of the house – Chypre Mousse smelled so old-fashioned to me (not in a bad way whatsoever – I adored it!) and I think a lot of the other ones must smell the same as well (I can’t say for sure as I haven’t gone through the whole set yet). I feel like even SL’s difficult perfumes have a number that would appeal to the masses, I wonder if that’s the same fr Oriza as well. Hopefully, for their sake, they do. What I wouldn’t give to smell some of their oldest scents, though – I imagine a house going back nearly 300 years must have created some truly amazing things. I’d love to know what sorts of scent were popular then, and how they smelled on the people then who didn’t bathe as often as we do, etc. Such an interesting and lush history behind them, and hopefully a long future ahead! As I was just telling Poodle, I’m rather glad they’re not going with the 1700s scents, because I’m not sure I’d like them very much. They must have been so powdery and intensely floral to counteract the strong odors of the day! I keep thinking of Patrick Suskind’s Perfume, its descriptions of Paris back in 1760, and the perfumes that were made at the time. Specifically, Grenouille’s original perfume mentor. I’m not sure his fragrances would be my cup of tea. That said, from a purely historical standpoint, wouldn’t it be amazing to know what the Tsar of Russia wore and just what sort of violets he wafted??!!! Or how his violets differed from those of Prince Albert? It would be fascinating. As for the modern Oriza line, I think Chypre Mousse smells too different and unusual to have an old-fashioned feel, or even a modern one. For me, it’s just… something wholly different, apart from time. But that’s just me. I think the others definitely have a dated aspect to them and a few remind me of Serge Lutens’ fragrances, only older in feel. I don’t know how people are going to react to some of them, especially the florals, but €9 isn’t a huge financial investment, so hopefully, it will okay. It would definitely be amazing to know how the Tsar of Russia smelled 😀 ,honestly even if a 1700 fragrance smelled bad I would probably still want it, just because I would feel warm happiness inside, just thinking that I´m using the same perfumes that people from centuries ago used. I would truly be happy even if the perfume was weird or smelled old 😛 . You are such a perfume temptress! I love the retro look of their bottles and if you love them then they are definitely worth a sniff. Plus, I am always happy to support any brand who nicely sells samples at a decent price. Thanks for letting us know about such a wonderful brand. I have been wanting to try Reve d’Ossian for months… finally ordered a sample set, can’t wait to sniff. I think Horizon and Reve d’Ossian are the two most likely winners for me. Great packaging! I’m keen to try these. I’m very very new to niche perfumes but there was a post in one of the Facebook perfume groups I’m in and saw the sample set was pretty affordable. So I jumped on board! All I can say is, every scent was truly unique! Nothing like the very few scents I’ve been testing out. I am in love!!! These truly transported me back in time to another era! I love love Relique d’Amour! Only wished that it lasted. Also fell hard for Oeillet!!! I think this is my first introduction to carnation. Love reading this post! Will head over now to check your reviews! Hurrrah, another person who thinks that Oriza is completely unique and very evocative. I’m so glad, Anige. It’s a shame that Relique d’Amour didn’t last on you. I had that problem, too, but then my skin is extremely difficult and consumes perfume. I have you on my list for the drawing, at #51. Good luck, Anige. Wow! Just shows how much there is to learn! I wish I had known about this house when I lived in Paris. I’d love to see the bow ties as well. The fabrics look heavenly. Chypre Mousse sounds divine. But Relique d’Amour sounds so unique. Thank you for the introduction. You’re welcome. I love learning about new houses myself, especially if they come with a very impressive, very ancient history. 🙂 And I’ll put you down for the Giveaway drawing. Good luck. Thank you for a look into the complex & mysterious world of scent. I love the challenge Frank Belaiche has created by waking these beauties & releasing them into the modern world. Beautiful bottles, magical descriptions. I want to experience everyone!